I am not just the chief accountant, not just a “numbers person.” I think bigger than that — I am focused on accountability, not just accounting. I am good with numbers, they come easily to me; and I have the added benefit of being creative and possessing some critical people skills, allowing me to understand the social and emotional aspects of business. Therefore, I make it my job to understand the overall operations of your organization. I want to learn how your business runs, and especially how finance affects the running of the business, and vice-versa. What I enjoy most is helping people solve problems. I like working with people who are bold and want to do new things, who understand they don’t have all the answers and are willing to ask for help, and who seek out challenges that bring about change. The ideal customer for me is someone who is forward-thinking, willing to learn and exciting to work with. 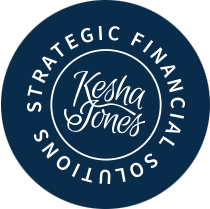 If Kesha Jones Strategic Financial Solutions sounds like the kind of financial services partner you are seeking, then I encourage you to contact me today. I will help you focus on what you do best — the revenue-generating activities — while doing my best to make sure you feel confident that your back office is working as efficiently and effectively as possible.